After a dive into the Decision-Making Guide, we are ready for part 2 of Pile Demolition (you can read part 1 here). In the first part, we covered step one, which is sorting out a pile into 2 containers: 1) things that have an action, and 2) things that need a decision. With the help of the Decision-Making Guide, step two was to sort the second container into things you definitely want to keep (stays in the container), and things that need to go away (put into a donation box or throw away). You now have a “do” box (the first container) and a “decide” box full of things that you definitely want to keep, but need to figure out what action to take. You should also have a box to give-away and a very full recycle bin! At this point, I find it helpful to get a pad of sticky notes to make some category labels for actions. For instance, I might make labels for “file,” “fix,” “talk to hubby,” “return,” and so forth. You can create your own personalized labels to fit your situation. Just create them as you go along. Spread the sticky notes out on the floor and put anything that belongs in that category beside the sticky note. Some of these will be easy and obvious—mostly things in the “do” box. Other things may be harder, usually because the item doesn’t have a home or is really a project. This will mostly be the things in the “decide” box. Dana White at A Slob Comes Clean talks about How to Declutter Without Making a Bigger Mess. Overall, I really like her method. It is a realistic way to make progress when you are just not an organizing machine (let’s be real). Basically, each item is either trash, donate (because you don’t need it), or put it away right now. But I would like to add one other box to her helpful formula: a project box. Sometimes there are things in a pile that don’t have a home. So, you can’t put it away, but it is not trash and you don’t want to donate it. Now, her solution is to deal with the situation immediately (i.e., go create the home for it to live in). But I find that I lose too much momentum if I stop to create a “home information binder” for an address list. For one thing, I may not have the stuff I need to make the “home.” For another, I would probably have to clean something else out to make a space for it. That would starting another pile before I’m done dealing with the first pile. Some of your actions will be one-step things that you need to do, like making a call or buying something. You can group all of these things together in a pile that identifies the basic action (i.e. “buy”, “call”, “file” etc.). Other things will involve multi-step projects, like creating a “home” for something or planning an event. What if you don’t have room for all this? 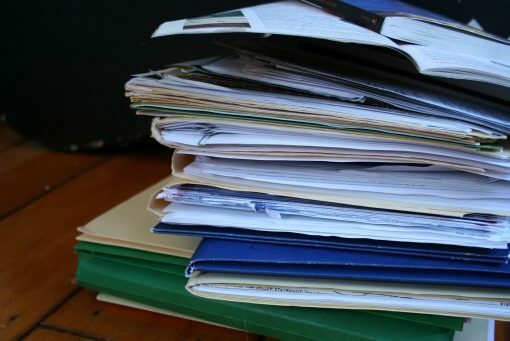 Now, if your situation does not allow you to spread out on a big floor with little piles everywhere (like, you have small kids, or you can’t get through it in a single session), I suggest that you get yourself a bunch of file folders (I’m assuming that most of your pile is paper). Put the temporary sticky notes on the tabs. Then, find a box that you can “file” in while you sort things out. Just take one paper at a time and put it in a file folder that identifies THE ACTION you need to take or THE PROJECT that it belongs with. Let’s sum up where we are at this point. Step one: you sorted everything into 2 containers: 1) do, 2) decide. Step two: you e-VALUE-ated your “decide” container into 3 additional containers: 1) definitely keep (your original container), 2) recycle bin, 3) donate box. Step four: you made project folders (“create a home,” “plan event,” etc.) and filed them into a “projects” box. You’ll need two more containers for containing non-paper items: 1) put away, 2) needs a home. I suggest using a laundry basket for the items that just need to be put away. It’s easy to carry this from room to room. You can also repurpose any boxes you have emptied in the process. The box for things that need a home can be thought of as an extension of your “project” box. It’s also for projects that don’t involve paper, like sewing on a button or fixing something. As you go along, keep putting anything you can into the recycle bin and donate box! At this point, you will have a lot of small, labeled piles (or folders) that have concrete, single actions, or are multi-step projects. You can start knocking out the single action items in order of easiest, fastest tasks first. This gives you the win of seeing major progress). For me, this means putting non-paper items away and then doing anything that can be done in less than two minutes. You would be surprised at how many things can be done in less than two minutes. Things that take longer than two minutes and multi-step projects can be tackled another day. You will need to build a system to deal with these things. At this point, you will have put away all the things that have a home and done some of the quick easy things. But if you’re anything like me, you still have a lot of things left to do! Each pile should now be put into a folder with an appropriate label if you haven’t already done this. The folders should be put into a file box so you can easily see the labels. Depending on the volume of papers, you will have one box (or several) for all the folders and one box that contains non-paper items that are part of a project. If you made it this far, the next step is creating a system for dealing with your to-do list and inbox on a weekly basis (instead of creating a new pile!). I suggest you join the STEP program run by April and Eric Perry. They will lead you step-by-step to build a weekly routine for processing your papers, projects, and to-do list. To find out more and get a taste of how they do things, you can sign up for a FREE webinar designed to help you finally stop drowning in piles, clutter, email, and to-do lists. Sign up here.